Christian Renard, left, from the Academy of Music and Business in Sweden and Marshall Via, from Oaks Christian School in Westlake, Ca. perform. Soundtrap, a collaborative music and podcast creation tool for the modern classroom, is pleased to share the success story of a global music partnership between California’s Oaks Christian School (OCS) and Sweden’s Academy of Music and Business (AMB), which was facilitated with the Soundtrap for Education platform. Soundtrap is an innovator in bringing meaningful multimedia content to classrooms worldwide, enabling students at all grade levels, regardless of experience, skill level, or special needs, to create high-quality music and podcast projects. In this year-long project, the students in the United States and Sweden were able to connect through the Soundtrap platform, work collaboratively on musical compositions, plan joint concert events, and follow through by successfully performing onstage together in both nations. Soundtrap’s technology enables students in classrooms of all kinds to create, collaborate, and communicate together and, in this case, it worked just as effectively for students whose physical classrooms were across the globe. Oaks Christian School, in Westlake Village, is a non-profit, private high school and middle school that opened in the year 2000. 12 music students from OCS spent several months collaborating with a dozen of their peers from AMB via the Soundtrap platform. The students worked together to plan out a joint concert performance exchange, which culminated in an overseas trip to Sweden with two concerts performed, followed by two reciprocal concerts in the United States. A highlight of the collaboration for the Oaks Christian students was an opportunity to perform a live concert at the American Embassy in Stockholm, just days after last April’s terrorist attack had shaken the Swedish capital. The American students were joined for the performance by their peers from Sweden and, even though they’d had no chance to rehearse together in-person, their collaborative work through Soundtrap prepared them for a successful joint performance. The Academy of Music and Business, located in Tingsgryd, was launched by world renowned songwriter and entrepreneur Andreas Carlsson and musician Magnus Lundin to be a place where musicians could collaborate with other musicians, hone their skills, and learn how to be entrepreneurs by developing their brands and marketing their talent. 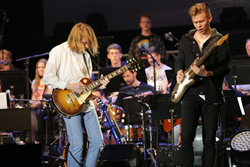 In late April, the AMB students had their own chance to travel overseas, heading to California for two nights to perform joint concerts alongside their OCS peers titled "Spring Spectacular: Powerhouses of Rock and Pop." The concerts featured more than 130 instrumental and vocal musicians performing songs that have been recorded or written by American and Swedish artists and songwriters. “Working on this project with the faculty at Oaks Christian―including Mary Kay, Jim Altizer, Ed Rouse, and Joe Diblasi, has been an absolutely incredible experience. I'm very proud of what we have created together and the impact this project made on the students from AMB and OCS,” said Gezim Gashi, Head of Public Relations for the Academy of Music and Business.